Happy Hugo is an online casino with an appetite for growth. It constantly attempts to strengthen its position in the industry. It does that by offering popular games and emphasizing deals with the best value to the player. The main page with the light white background and easy navigation buttons is perfect for explorers of new sources of entertainment. All the available games are placed in distinct categories in order to make the game search more convenient. Club Hugo provides information about the latest winners and delivers news items that are relevant to the users. It also the place where the player can access the latest promotional offers. The deposit and withdrawal methods are revealed inside the terms and conditions. They would include; Skrill, PaySafeCard, WireCard, CNG and Adyen. Multi layered security procedures are implemented in order to deal with safety concerns and allow for the secure flow of information. The users can contact the staff via e-mail and live chat. The players from certain countries can count on bonuses. They apply to users from the following places; Australia, Belgium, Brazil, Canada, Finland, France, Germany, Italy, Japan, Mexico, New Zealand, Norway, Portugal, Spain, Sweden and Switzerland. Real money betting is forbidden to users from these locations; United States of America, US Territories, Israel, United Kingdom and Curacao. In terms of language support, the following tongues are supported by the casino; English, French, Portuguese and Swedish. The popular games category is shown in the games section at Happy Hugo Casino. Here are some of the games that have made it into this category; Secrets of Atlantis, Pyramid Quest for Immortality, Platoon, When Pigs Fly, Storming Flame, Aloha Cluster Pays, Fruit Zen, Gold of Ra, Starburst, SugarPop, Bids, Glam Life, Twin Spin, Basic Instinct, MegaBoy, Charms & Clovers, Gonzo's Quest, Nrvana, The True Sheriff, Dracula, and a few others. The website also hosts games in categories such as; New Games, Slots, Table Games, Live Games, Video Poker and Jackpots. These categories also feature good games like; Birds, MegaBoy, Glam Life, The True Sheriff, and many others. These games come from some famous software providers such as; NetEnt, Betsoft, and iSoftBet. The website has not received any serious complaints. 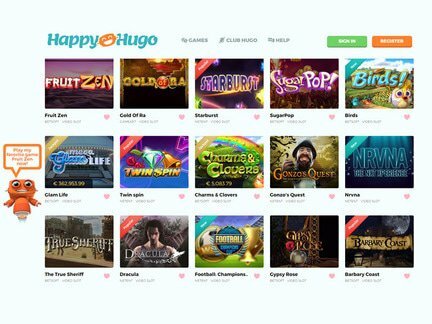 The Happy Hugo Casino Bonus deal offer has been evaluated positively. The criticism might appear in the future. For now, the casino is doing a good job when it comes to customer support. It is still a new player in a saturated online casino market. Its fate depends on how well it will respond to the changes in the industry. The casino is operated by Flavidius Limited. It is licensed in Curacao. While the license does not have much value in terms of quality assurance, it is important for the purpose of establishing the casino as a legally functioning entity. It must be said that there are better licensing bodies out there. But the Curacao license is fine, as long as the above limitations are acknowledged. The casino website was created in 2016. I am grateful for getting the opportunity to play good games at Happy Hugo Casino. In my opinion, the selection of games is superb. The cash drop deal also makes the casino stand out in the realm of promotions. I can say the same ting about the welcome bonus and VIP bonuses, which add-up to a substantial offer. Unfortunately, the lack of free no deposit deals takes away from an otherwise good offer. Since the casino is interested in constant expansion, I would recommend the place to seekers of ever-new thrills.